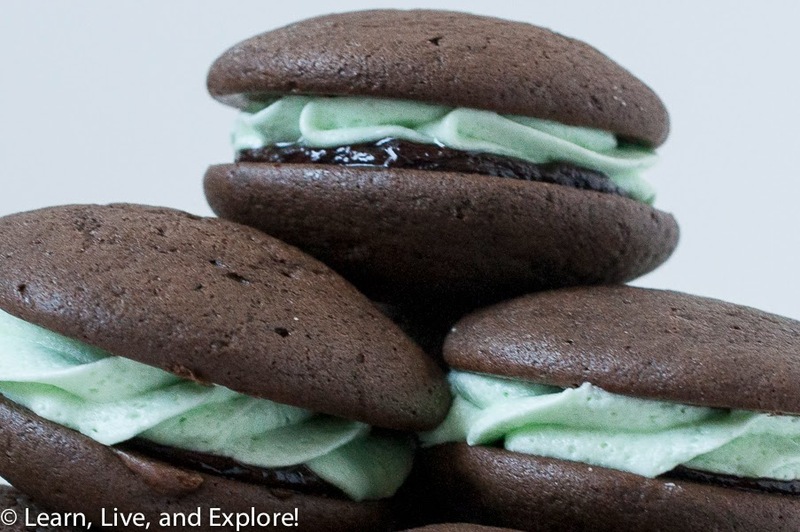 Grasshopper Sandwich Cookies ~ Learn, Live, and Explore! I'm the first person to say that chocolate and mint together do not make a good combination for my taste buds, but I recognize I'm in the minority. And it's almost St. Paddy's Day, so green is the theme for baking! 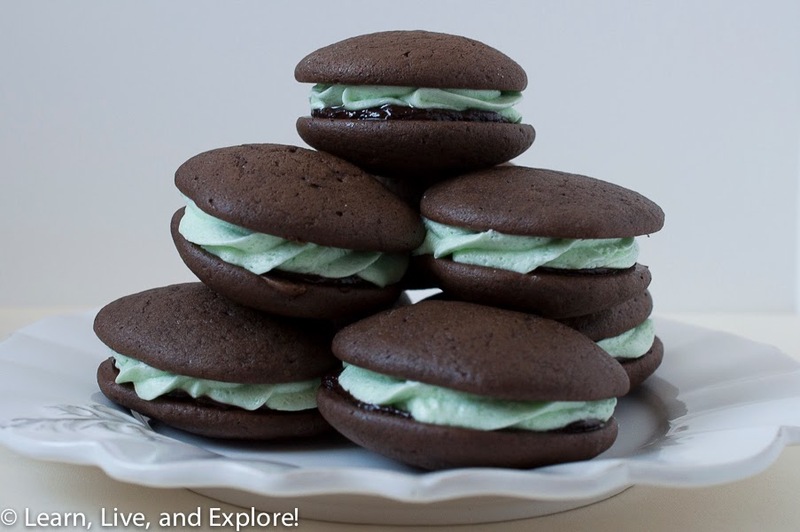 Fortunately, I have a willing group of taste testers who are looking forward to biting into these chocolatey, minty, squishy sandwich cookies - more commonly known as Grasshopper Cookies. Today's recipe is courtesy of Peanut Butter & Julie - a blog title I wish I had, by the way! In a medium bowl, whisk together flour, cocoa, baking powder, baking soda, espresso powder and salt. In the bowl of an electric mixer fitted with the paddle attachment, beat butter and sugar at medium speed until light and fluffy, about 2 minutes. Add egg, yolk and vanilla, beating until well blended. On low speed, add the flour mixture to the bowl in three additions, alternating with the milk, beating until blended after each addition. Using a small cookie scoop or a spoon, drop batter by the tablespoon onto the prepared baking sheets, spacing apart. Bake until cookies are puffed and set but still soft, rotating positions of baking sheets halfway through the baking process, 8 to 10 minutes. Cool cookies completely on baking sheets. For the mint buttercream: In the bowl of an electric mixer fitted with the paddle attachment, beat the confectioner's sugar, butter and salt until well combined. Add the creme de menthe, and beat until blended. Add the cream to the bowl and beat the mixture on medium speed until the buttercream is very light and fluffy, about 2 minutes more. For the ganache: Bring the cream to a simmer in a small saucepan. Add the chocolate, reduce the heat to low and whisk constantly until the mixture is smooth. Add an additional splash of creme de menthe or a 1/2 tsp (2 mL) peppermint extract if you want your cookies to have an extra minty flavor! Allow the ganache to cool and thicken for about 15 minutes. Fill a pastry bag fitted with a star tip with the mint buttercream. Pipe a layer of mint buttercream onto the flat sides of the remaining cookies in a round swirl. Sandwich together the mint buttercream and ganache cookie halves, pressing to adhere. Serve room temperature or chilled. National Geographic Museum in Washington D.C.